After you have removed all four lock rings, its time to start removing u-joint caps. You have several options here. You can use a socket (one you don't care about), and a large hammer to beat the caps out. 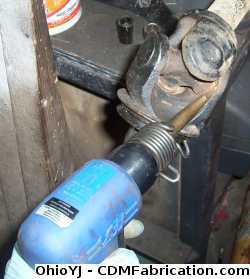 Now I'm gonna take the easy way out, and use a ball joint press. These can be rented from AutoZone. 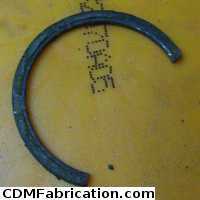 Harbor Freight sells them at a reasonable price too. 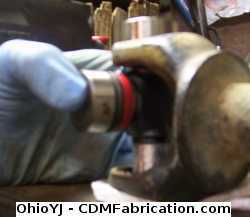 The ball joint press will make this job much easier. 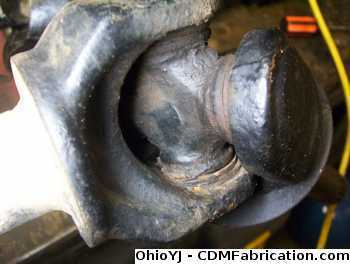 The wheel joints I'm changing here or from a Dana44 that was made in 1980, so they were rather stubborn. 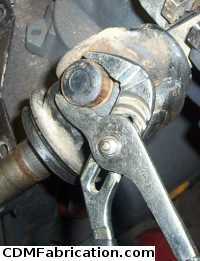 If you aren't having much luck with the ball joint press, tighten it down tight, then use a big hammer and actually smack the ball joint press. Many times you will have to tighten the ball joint press, smack it with a hammer, tighten the ball joint press, smack it with a hammer. It can be a long drawn out process. 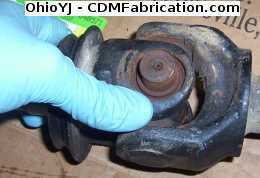 You may hear popping/cracking noises as the u-joint comes out, so don't worry if it sounds bad. 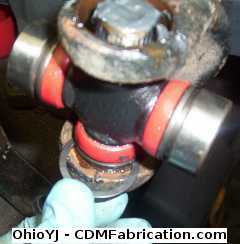 Notice in this picture I've coated the U-joint cap in a thin film of oil, it makes pressing it back through much easier. DO NOT just jump back into using the press to push the u-joint back through the other direction. 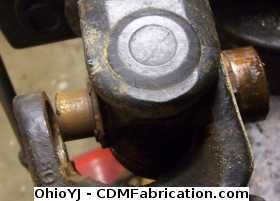 Do your best to line the u-joint up, and start beating the u-joint cap back through with a hammer. Once you get it started, you can switch back to the press. 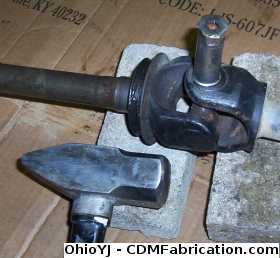 Once you get the cap pressed through, remove it, and you can remove that side of the axle shaft. 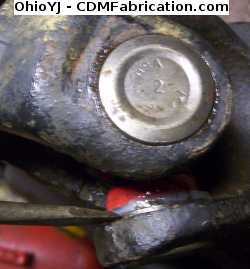 Repeat this process to remove the other two caps left on the u-joint. Now you are ready to install the new wheel joint. 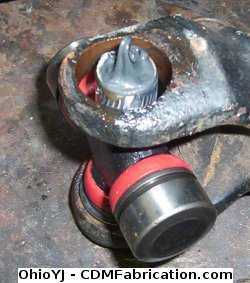 Again, use a thin film of oil on the caps to ease the installation process. 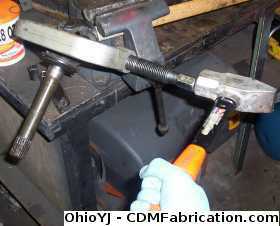 Hold the u-joint up into the cap, and tap it in with a hammer. Once you have the cap in on one side, go ahead and install the new lock rings. They should pretty much just press on. However it never hurts to give them a little tap with a screw driver just to make sure they are seated fully. 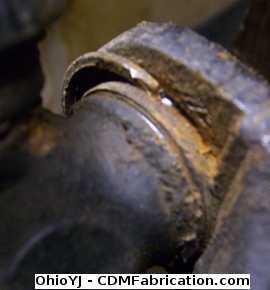 If your wheel-joint is greaseable you should grease it after installation. 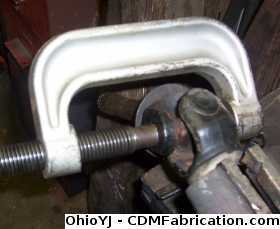 I normally use greaseable joints, but not on the wheel joints, these are solid so I had to pack grease on each end. 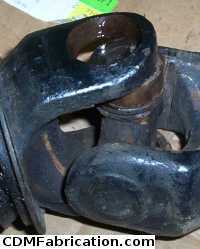 Most companies skimp on the grease, so make sure you have plenty in your brand new u-joint. Time to make things look pretty... :D While I had the axle shaft out, I went ahead and roughed it up, cleaned it up with brake clean, and painted it, just to help keep the rust to a minimum.